Table is designed to hold ice keeping food and beverages cold. Use indoors or out. Weight capacity 500lbs including 75 to 100 lbs. of ice. 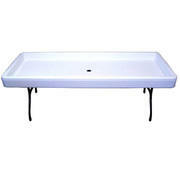 The Fill and Chill Table is an ideal party ice table. A convenient way to keep cold foods and drinks fresh.